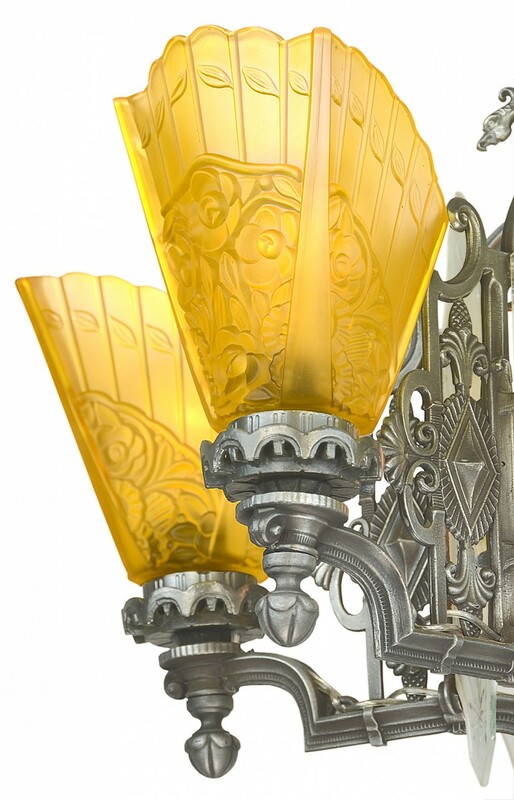 Fantastic Art Deco 1930s chandelier. This is such an unusual light, it is hard to find a place to start. 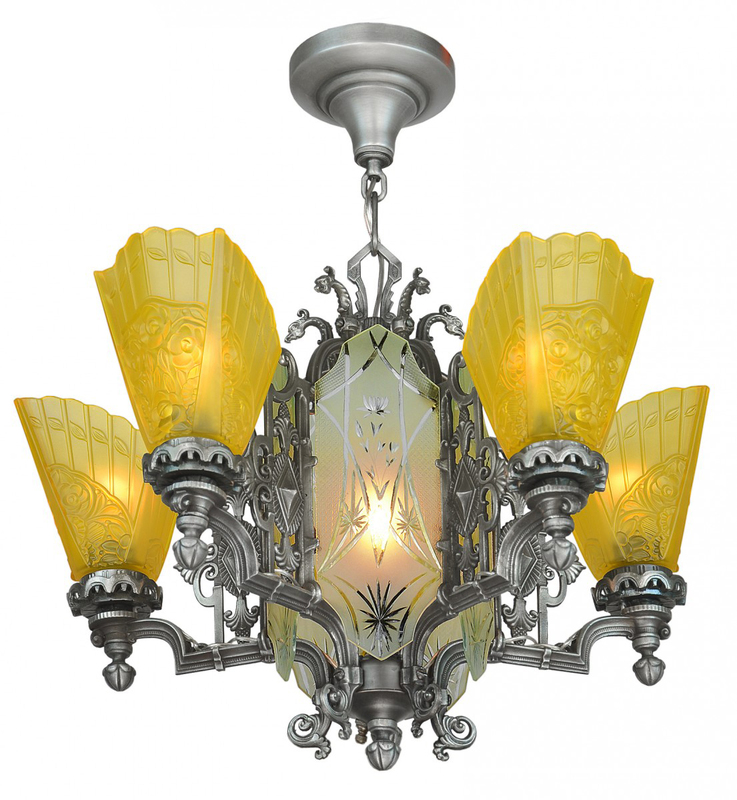 First, it is a 6 light fixture. 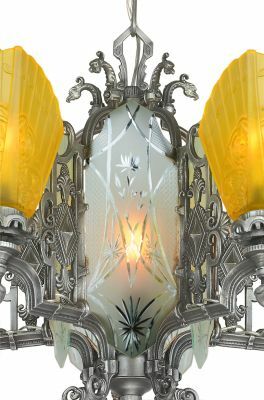 Five of the lights are on the outside on the arms, in the gorgeous amber shades, and one is in the center behind the fine--cut glass--center panels. The five cut glass center panels are just plain gorgeous. They slip in from the top and I am pleased to say that they are in mint condition with so little roughness that it is not worth discussing. 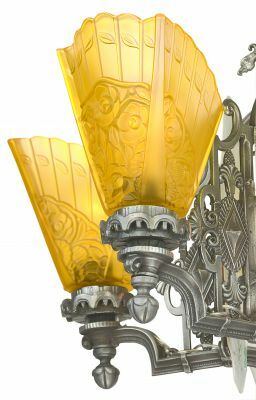 The shades, for each of the arms, while being lovely embossed amber, are also in outstanding condition with only the most minor of roughness. The metal of the chandelier is, I believe, aluminum and some iron and steel- for the main fixture metals which has a nice ambiance of a pewter finish. Unique design here compared with other chandeliers that we have had....i.e...The dragon head terminals at the top of each arm. Please see the close-up picture. Rather a nice touch...All a very nice appearance. Cut glass center panels...amber embossed shades...nice metal work including dragon heads....What a statement it makes ! Measurements: OA Height: 24" x OA Diameter: 21"
Price: $1,450 which includes all the shades and the lovely cut glass center panels. Plus a crating and shipping charge.